The Fine Gael MEP thinks he and colleague Mairéad McGuinness could take two seats in ‘Midlands North-West’ but admits “it’s a big ask”. SITTING MEP JIM Higgins is not worried about any of his competitors in the ‘Midlands North-West’ constituency. “I don’t worry about others, I do my own campaign … I just play my own game,” the veteran Fine Gael MEP said. “Put the best foot forward, put your mantra out there. I’m not into negative campaigning, even when Fine Gael were in opposition I didn’t engage in negative campaigning … Don’t get personal with people,” he advised. One person he has repeatedly refused to ‘get personal’ with is Mayo TD John O’Mahony. 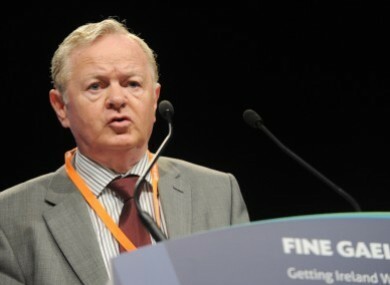 Last year there were reports that Fine Gael headquarters was pressuring Higgins to step aside so that O’Mahony could take his place on the ticket. The former TD and Senator said that there was “absolutely no truth” in the rumour he was asked to step aside, adding that the claim appeared during “silly season” when the Dáil was adjourned for the summer. The Mayo-native was campaigning in Kildare recently and said he was “very heartened” by the repsonse. “It was like doing a mock exam and the results of the exam were quite good,” he added. Higgins, who has served as an MEP since 2004, noted that many people from the west now live in the Dublin commuter belt and that his election campaign will “try to harness the good will of people who were born in the west but not given a livelihood there”. Given his commitments in Brussels and Strasbourg, Higgins said that his canvassing will be “essentially a weekend campaign”. Earlier this month, he was named ‘Transport MEP of the Year’. “Why did I win? I worked hard, I rolled up the sleeves and went to every meeting,” he said. The Higgins Report on e-tolling was backed by 516 votes to 111 in the European Parliament last June. As a result, all European roads will have barrier-free tolling by 2016. Higgins said that since reform of the Common Agricultural and Fisheries Policies was finalised and people were “relatively happy” with the results, “very little of European interest comes up on the doorstep”. He noted that it was necessary to hold the European election on the same day as the local election to ensure people vote. “I just fear that if you have the European election as a stand-alone event, the turn out would not be very high … that’s frightening,” he said. *Helen McEntee won the Meath by-election on 27 March 2013 after the seat became vacant following the death of her father, Shane. At the end of the interview Higgins was given TheJournal.ie‘s EU politics quiz — four questions on the history and workings of the European institutions. So how did he do? How many seats will there be in the Parliament after the election? What was the last country to join the Eurozone? Let me think … ask another question. Who is the President of the European Commission? How many countries are in the eurozone? 17, as far as I know … [It's 18] Yes, 18 after the last one. And what was the last country to join the Eurozone? Email “'I just play my own game': Jim Higgins not worried about his re-election battle”. Feedback on “'I just play my own game': Jim Higgins not worried about his re-election battle”.